A Gift for Them & a Gift for You! Give a monthly gift program and receive up to $300* to spend on future purchases at CalyxFlowers.com. Click here for complete offer details. A sensational, ambiance-elevating experience; this unique monthly gift program always comes as a welcome surprise. 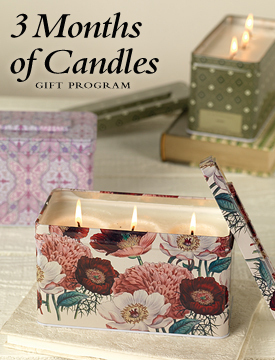 Designed to be enjoyed often, it features three monthly candle deliveries. Floral fragrances include: delicate and heady Peony, warm and earthy Moss and fresh, calming Lavender. NOTE: We’ll announce your gift with an elegant personalized card sent before the first shipment. It is sent via U.S. Mail within two business days of your order placement. Please allow 5-7 days for delivery of this special announcement card.